A certified nursing assistant is on the front lines of patient/resident care. The nursing assistant position is certainly one of the most vital to daily operations for the nursing care facility, your compassion and skill in patient/resident care will help minimize the stress of those who are sick or unable to care for themselves. Certified nursing assistants (CNAs), also known as nurses' aides, patient care technicians, and home health aides, work under the supervision of a nurse to provide assistance to patients with daily living tasks. Working closely with patients, CNAs are responsible for basic care services such as bathing, grooming, and feeding patients, assisting nurses with medical equipment, and checking patient/resident vital signs. CNAs give patients important social and emotional support and also provide vital information on patient/resident conditions to nurses. A certified nursing assistant job is a great entry point for a nursing/medical career. You'll be deeply involved in patient/resident care, making sure that sick and injured people have their basic needs met. And you can be ready to start working as a certified nursing assistant in a very short period of time. Job prospects for CNAs are expected to be excellent due to the increasing long-term care needs of an aging population; jobs in this field are expected to grow faster than the average for all careers at this time; and in our facility, a new NA will earn $ 11.10/hour to start and after 90 days and certification 11.50/hour. 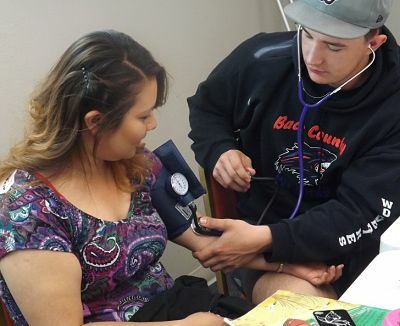 The next class will be April 15th through May 3rd of 2019 with classroom instruction in our nursing assistant program including basic nursing skills, anatomy and physiology, nutrition and infection control. Students also gain hands-on-experience during clinical activities in our skills lab. Class and clinical are usually Monday through Friday 8am to 5 pm and all classes are 3 weeks long. If you are ready to take the first steps toward a certified nursing assistant and a career in health care, please call Sherrilyn Turner, Human Resources, at 719-523-4501, ext 160; Heather Burdick, DON LTCC ext #116; or Glenice Wade, ADON, ext #141. Nurse aides learn to care for hospital patients and residents in Long Term Care Centers. The Nurse Aide Class is an opportunity to begin a career in the medical field. The classes run three weeks, from 8am to 5pm, Monday through Friday. To apply, you must be 16 or older with no record of a felony, violent or theft crime and you must pass a drug screening to be considered for the class. A reading comprehension test and an interview will be completed prior to acceptance into the Nurse Aide Class. Note: For information regarding future Nurse Aide Classes or to be placed on the waiting list, please contact Sherrilyn Turner, Human Resources, at 719-523-4501, ext 160; Heather Burdick, DON LTCC ext #116; or Glenice Wade, ADON, ext #141.